As everyone’s favorite aunt, I arrive just as dinner is served. I buy the best gifts, and, without question, I am the most fun of all the adults, (until it’s time for diaper duty.) This role of “favorite aunt”, is far and away the best job I’ve ever had. The benefits are endless. Few, however, are near as fun as the annual holiday card tradition. All teeth smile, pets with hats, and ugly Christmas sweaters always yield a few minutes of giggles. As I sit here penning my Black Friday target list, it occurred to me that it’s about time for my mailbox to start filling with the annual holiday cards. You know, the shiny greetings with a clever phrase or a photo to make sure I remember birthdays between now and the next holiday. “Favorite aunt” status translates into 50-60 holiday cards each year. These mementos are designed to be kept as joyous keepsakes. I do treasure these relics, and they do sit on display in my foyer, until January 1, at which point they meet their destiny with Hefty. The annual holiday card custom, taken seriously by some, is foreign to me. I have friends who schedule the photograph in June, confirm addresses in July, have matching outfits bought by September and the envelopes stamped by Thanksgiving. For the first time, I became curious about the process surrounding these little slices of holiday cheer. Is it worth such a large investment in a family experience? What is the meaning behind creating memorabilia for the cast of thousands who make the mailing list? I still don’t know. But what I do finally understand, is the tremendous amount of work required; something I have dismissed for many years. The greeting card business is booming. Americans send 1.3 billion holiday cards annually. And this constitutes about 25% of the total annual greeting card sales. That’s a lot of smiling faces! To me, this effort is borderline a huge hassle. But if it’s a hassle, the masses wouldn’t continue the tradition, right? Obviously, I am the few, not the many. Having never considered the holiday card tradition – not one minute on the procedure – the custom, or the significance, where would I start? I have received beautiful cards over the years, some with comedic contributions, others with brilliantly-written poems or religious prose. Some are store-bought cards with handwritten notes, a few “e-holiday cards” that are sent in bulk by email, but the clear majority are genuine works of art that, to me, look so sophisticated and expensive, it’s amazing that anyone has any money left to buy gifts? The aptitude for creativity on some of these cards would suggest that any one of my friends should be the CEO of Hallmark. None is a photographer or graphic designer, so I could only conclude that there are services out there to assist with these holiday masterpieces. You need not look any further than my old faithful, Vistaprint. For more than 10 years, Vistaprint has been a fan favorite and the go-to for everything printed. While I have never crafted any sort of holiday card, I have printed a flyer or two, a few presentations over the years and, of course, the requisite re-order of my business cards. I don’t think it’s necessary to have not yet had a reason to look beyond Vistaprint. Vistaprint has created a science for the art of designing custom printing, with only a few clicks of the mouse. I studied communications, I don’t know the first thing about a pixel or setting a margin or A4 (you’re probably wondering, too, right? ); call me digitally challenged, if you will. If Vistaprint can guide a digitally deficient marketer like me to prepare a high-resolution presentation, they can certainly help with an ole holiday card or two? But I had to test my theory. Enter Vistaprints’ Holiday Cards & Gift page. 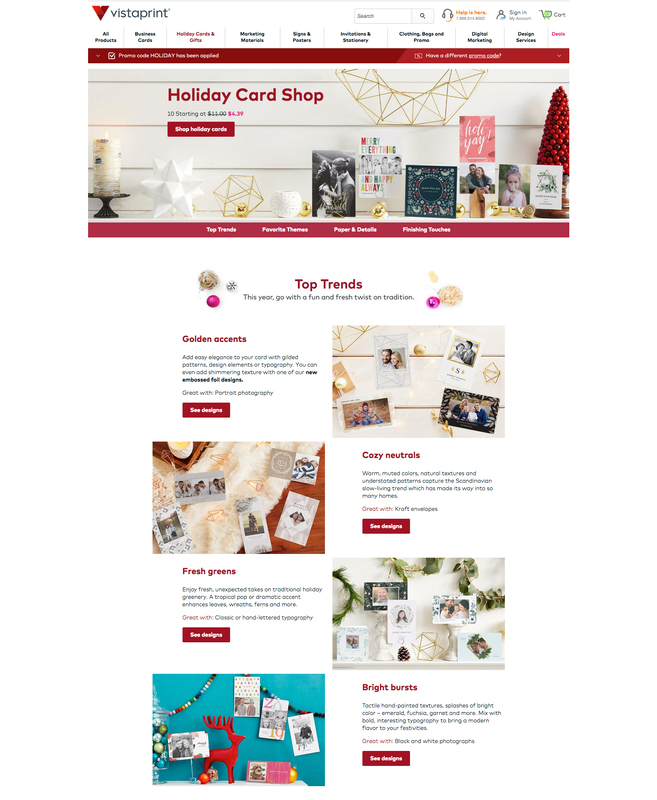 From trends to themes, paper types and finishing touches, Vistaprint is a virtual one-stop-shop for all your holiday card needs. What can you expect from the holiday cards page? In the simplest of terms — cards are customizable with your family/pet photos, new finish upgrades (i.e. Embossed Foil) available. You can expect quality, ease of design, and help from their design team (if you need it) for only $5. My first question is, when? When do you start the process of designing a holiday card? When should they be mailed? When should they be received? Is there such a thing as holiday card etiquette? Timing is everything, isn’t it? Without spending time digging into what Emily Post said on the subject, we are going to exercise some good old-fashioned sensibility, coupled with our experience shopping online. Like most things in life, the earlier you start, the smoother the process. At the very least, you have built in a window for shipping delays or printing hiccups. Some suggest mailing three weeks before Christmas, so the recipient can enjoy the fruits of your labor. Come the week of Christmas, all bets are off and most mailboxes are overloaded. There is little time left to read it all. If we were building a mathematical equation of the opportunity cost surrounding holiday cards, we’d have to quantify the meaning of “no more time to read any more holiday cards” for each new card received after December 19. If your card is received early, the recipient will spend more time enjoying your ugly sweaters or the cute dog. After all, isn’t that the point? If we want our holiday cards to be received three weeks before Christmas, when do we have to order them? Experts in printing and my personal mommy squad agree that it’s best to order three weeks before Thanksgiving Day. Cost-conscious, are you? Bypass rushed shipping and order pre-Thanksgiving. Wait too long, your reasonably priced cards have now doubled and will arrive just in time for no one to pay attention, as they have already moved on to planning for Spring Break. If you are adding a professional photographer to the mix, extra fees are exactly what you don’t need, nor a fancy, unusually-sized envelope or stamps with your initials on it. Select your design, select your size, select your colors, select your quantity, select if you want your corners rounded or square, full color, grayscale, front preview, glossy, matte, foil, Christmas, New Years, business, seasonal, embossed. Do you see a pattern here? For someone who asks questions as a profession, I have just questioned myself into a frenzy. I took all of my questions back to Vistaprint. I found a complete set of answers in simple, dummy language for this amateur. Everything I would ever need to know about creating a holiday card, a photo gift, design, paper, mailing, tracking, stamps, envelopes are right there, in a language I can understand. In fact, Vistaprint has a whole section — designed just for people like me. Still unsure if it’s really that simple? Upload your photo to see it sampled on a variety of cards and gifts. To be exact, I was able to see my photo on 2239 different items, perhaps a bit overwhelming for someone who has trouble making decisions, but certainly an astounding selection by any measure. Having trouble selecting a design or, prefer to use your own custom design? It’s all available with just a few clicks — clear as day instructions, tips, and advice. There is no other place like Vistaprint for the holidays. So many things to consider, so little time. Vistaprint is a virtual sea of holiday card magnificence. As it says on the website “there is no other place like Vistaprint for the holidays.” I concur. Each concept includes an expert tip to guide you. They even dedicate an entire page just for how to take a better photo, with tips and tricks, needs and smiles… you name it. If worse comes to worst and you are not finding the design you had in mind, arrange to speak to one of their experts. Shipping questions? Check out the shipping options here. Always flexible. Always helpful. Quintessential Vistaprint. It’s not too late! Start your holiday card process with Vistaprint today. Save big on custom holiday cards at Vistaprint, starting as low as $0.31 per piece using coupon code HOLIDAY at checkout when you shop through Dubli.com through February 1, 2019. Combine this offer with your Cash Back of up to 4.8%.